We've teamed up with our friends at K&I Juice to offer you a 1, 2 or 3 day cleanse that will help you kickstart a shift towards a cleaner diet and lifestyle. This cleanse is gentle on your system and has a bit more substance, so it will suit those who may be busy, physically active or feeling a bit nervous about trying a juice cleanse. Each day includes: 3 jars of K&I seasonal juices, 1 cold pressed smoothie, 1 750ml organic chicken bone broth by Nourish Kitchen & Cafe, 1 K&I organic herbal tea for detoxifying and weight loss. Bone broth is a powerful, nutrient rich, protein dense & easily digestible option for all walks of life - making it a powerful healing tool and a great addition to a healthy diet. 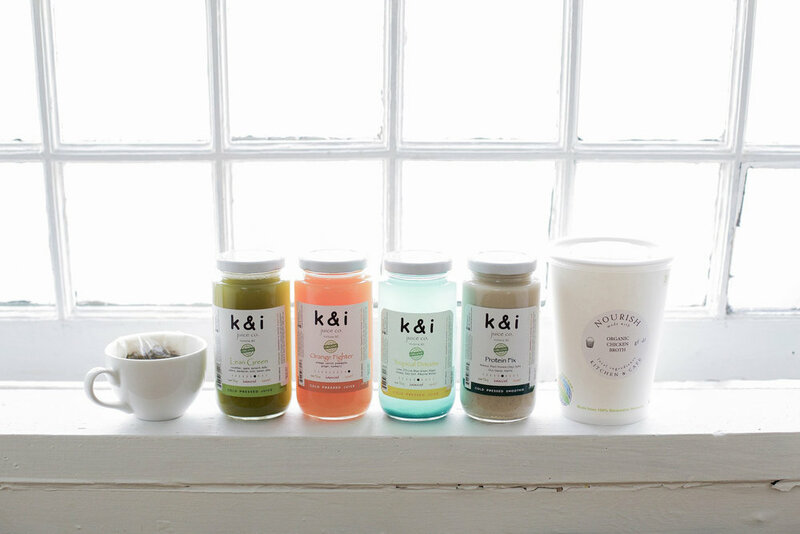 This cleanse is K&I's most popular during the cooler, Nourishing months.